HEY~ This is my first post,I'm Kayne from Hong Kong. After Hong Kong, I see Taiwan quite close, but I think Luzon island of the Philippines (capital Manila is on it) is more logical. After all, there is a fantical fan base for Amazing Race Asia in the Philippines. 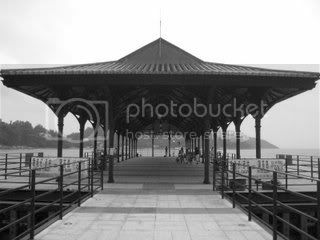 The pier where I saw Allan Wu.He's filming Amazing Race Asia there..
to RFF kayne from Hong Kong and thanks for sharing! Please keep us posted! Apskip, with cabio reminding us that the first and last city are the same in TARA, I think that Beijing could very well be that city. Since it is an Olympic year it would make great sense that they might try to use one of the Olympic stadiums for the publicity maybe. And plus--word on the street is that the 19th is very possible.. I want to note that the above blog was also noted by jonlover @ entermyworld.heavenforum as well, who had it first doesn't really matter since we all use the same detective skills to search blogs, lol. And a sighting in of all places Hanoi!! To change the topic, I hope you are all watching Amazing Race! They're in Vietnam and are visiting some of the places that we have a great affection for, namely the City of Hanoi and Halong Bay. Nice to see it all again - very special places and memories. Now how can we coax jonlover to join us here ? Thank you kaad! We'll keep hoping! Haven’t been updating because there’s no internet where I am staying. But have been enjoying myself a lot staying with Aunty Beeyong! So I spent very little time in Hue. After the first day on the tour with Café on Thu Wheel, I decided I wanted to get to Hanoi quickly. I don’t know why, but like I told Ian, I got bad vibes in Hue. It feels unsafe, I can’t seem to get around with much ease. I had wanted to take the first train the next morning to get to Hanoi, and the lovely receptionist and possibly boss rode to the train station to see if he could get a ticket for me at 2000h in the evening. Alas, the train is only mine to dream of. There was no ticket left for any of the trains the next day, so I settled for a bus ticket. I went to the Citadel that afternoon since I have time. Went into the Imperial City. It was so-so, perhaps because I have no guide, perhaps I should have studied harder when we were studying Chinese influence in Vietnam then, anyhow, I saw Allan Wu. Then I realized that they were filming a leg of the Amazing Race Asia there. Haha. I walked past him nonchalantly. He’s no Takeshi Kaneshiro. A team asked me for direction. I told them a very general direction. I hope they didn’t get lost, otherwise I would always be that cursed Asian tourist. Haha. I went back to the hotel for lunch. The hotel has lovely lovely staff. I reckon they are family/friends. I ate a lot, because I know I would get motion sickness if I didn’t. I brought my half-eaten Oreo onboard too. Since the journey to Hanoi should be twelve hours, I was rather worried that I would reach Hanoi early in the morn. What a nuisance/annoyance that would be if I were to knock at Uncle Mike and Aunty B’s house at 6am in the morn. So I devised my breakfast plans in order not to reach too early. The bus has to be the worse I have taken throughout my entire journey. They switched off the a/c during the trip. It became really hot and stuffy. The Caucasian couple in the seats in front of me opened the window. What a relief. However, even when the a/c was switched on again, they didn’t close the window. There were parts of the journey where it stank quite badly. This time the sleeper bus was quite different from the previous one I took. This one doesn’t have individual ‘bed’, but the beds were like normal seats extended. Though I had plenty of legroom this time round, I hate the fact that someone was sleeping so close to me by my side. Despite the heat, I slept in my sleeping bag to avoid being touched or touching people. I had prayed so hard that it would either be a good-looking guy or a lady who’s next to me, but it was the back-up bus driver instead. The bus stopped a lot, either for pee-break or for people to alight or to board. There were times where the bus moved at a snail’s pace because of the heavy traffic before dawn. What a surprise! By 9am we weren’t in Hanoi yet. And when we finally reached, they dropped us at the outskirts. I didn’t want to enter just any cars, so I asked this German gentleman and his Indonesian companion if I could hop into the same car and head for the same destination as they were. The German gentleman is a very pleasant man, knowing that I was traveling alone, he came by to check on me once in a while. The lady, less friendly, studied German linguistics and is now lecturing in that subject in a university in Germany. Reached the Old Quarters, well, it’s familiar territory since the first hostel I stayed was in that area, I heaved a sigh of relief. Bid farewell, went to get stuff for Uncle Mike and Aunty B since I didn’t want to go to their house empty handed. Enquired about my destination with the tourist office, and they called a taxi for me. The muffins were expensive, $2.50 each, and I don’t think they were that tasty. Uncle Mike said they tasted like cookies. Reached their place but they weren’t around. Their helpers led me to the place I was going to stay. I was to stay at their friend’s house while she’s not around. The house’s lovely, and guess what, their friend is unaware that someone is staying. Quite cool right? You leave your house keys with your neighbour and you allow them to host their friends there. I suppose they are really good friends. Seeing Uncle Mike, Aunty B, Peace and Daniel was great! While it signified the end of my traveling, it felt like going home. Talking to Aunty B is inspiring. So sometime between May 24, 2008 & June 1st the blogger saw Alan Wue in Hue Imperial City (The Citadel) ? The sighting could fit into apskip's timeline "May 27/28 ToBeDetermined" ..I wonder if they will ever leave Asia or when? If I'm reading the Hue bloggers dates right she may have seen the teams on the 25th? as she had some time to kill before her bus departed. There was no ticket left for any of the trains the next day, so I settled for a bus ticket 25th? I went to the Citadel that afternoon since I have time. Went into the Imperial City 25th? It was so-so, perhaps because I have no guide, perhaps I should have studied harder when we were studying Chinese influence in Vietnam then, anyhow, I saw Allan Wu. Then I realized that they were filming a leg of the Amazing Race Asia there. Haha. I walked past him nonchalantly. . 25th? Did the race start filming earlier that thought and is now finished? Did he just meet up with his family in transit on his way somewhere else? Could it be mistaken identity? Wondering why I put a question mark after studying? Oh well, I went studying with my classmates at the airport yesterday and we did not really study at all did we? At first they set the time to meet at 11.30am but later changed it to 2.00pm then to 2.30pm, lastly I reached there at 3.30pm. Then we studied in the T2 mac, the table was really very small and amanda was cursing the group behind us, they were taking one big table to play cards when the table could be useful to us. But we got another table so it was still ok, I was so tempted with the food and went to eat instead. Phoebe had a cough but was very tempted for mcspicy, I told her just eat because no one could withstand the greatness of mcspicy, but the typical mother devien was nagging all the way to tell phoebe not to eat and say that I am a bad influence to phoebe. In the end, phoebe went to get mcspicy meal with a mcflury. We wanted to study after that but all of them just take out their laptops and starting surfing the net. It was like 6pm already and we did not do anything. Later, the manager came to chase us off because there was not enough seats for the customers. So we went to the viewing mall to study instead. When we reached there we saw celebrities!!! We saw allan wu and his wife and childen. Phoebe was admiring them and called them the perfect family. Quite true, the father was playing with the kids while the mother was sitting down laughing at them. Did the race start filming earlier that thought and is now finished? It is very possible that the race started well be fore May 20. The end of AR13 would have been very good cover for ARA3 to start quietly. Did he(Allan Wu) just meet up with his family in transit on his way somewhere else? Phil took many hours in New Zealand and you have to believe he went to visit his wife and children. Could it be mistaken identity? Sure, but it's not likely. Allan is a well-known TV star in Asia. Kogs, I would like to know more about how you know that it was a 17 hour train ride to Hue. Hue is an ancient provincial capital that was the site of some of the bloodiest battles in the Vietnam War during the Tet Offensive in 1968. During the Battle of Hue, the city suffered considerable damage not only to its physical features, but its reputation as well, most of it from American firepower and bombings on the historical buildings as well as the now infamous massacre at Huế committed by the Communist forces. Hue is 55% of the northbound distance between Ho Chi Minh City(aka Saigon) and Hanoi. it has a population of 340,000 people. I was pretty sure it had been rumoured that filming started around 18-20th too, and if that was true it couldn't be possible to be completed with filming yet....just speculation but a last goodbye with his family at the airport before the 'out of Asia' segment starts seems more likely atm than the other possibilities.... can anyone identify the airport they are at? Tan Son Nhat Airport was first constructed in the 1930s by the French Colonial government as small unpaved airport. By mid-1956 United States of America foreign aid built a 7,200-foot (2,190 m) runway and terminal facilities to became South Vietnam's international airport. During the Vietnam War, Tan Son Nhut Air Base was used by both the United States and the South Vietnamese Air Force (VNAF). Ho Chi Minh City Tan Son Nhat International Airport, a joint civilian and military airport, is located 4 miles (6 km) north of the center (District 1) of Ho Chi Minh City (Saigon). Located at 10°49?08?N, 106°39?07?E, 33 feet (10 meters) above sea level, Ho Chi Minh City International Airport is located 4 miles (6 km) north of Ho Chi Minh City center. thought i remeber flo saying something About it. puddin, it was on jonlover's blog that you provided a link to up above. I have to say that I consider it speculation on his part that the race began May 18 in Bangkok. How would he know that? It may be true and it may not. The adventures started at the airport in Chiang Mai when three sets of couples ran past us, each trailed by a camera guy and an audio guy. We are pretty sure that they were part of the show The Amazing Race but when we asked them all one guy could say was "I don't know what you're talking about." Yeah, right. That is classic Amazing Race crew behavior. Why would a local race be evasive?